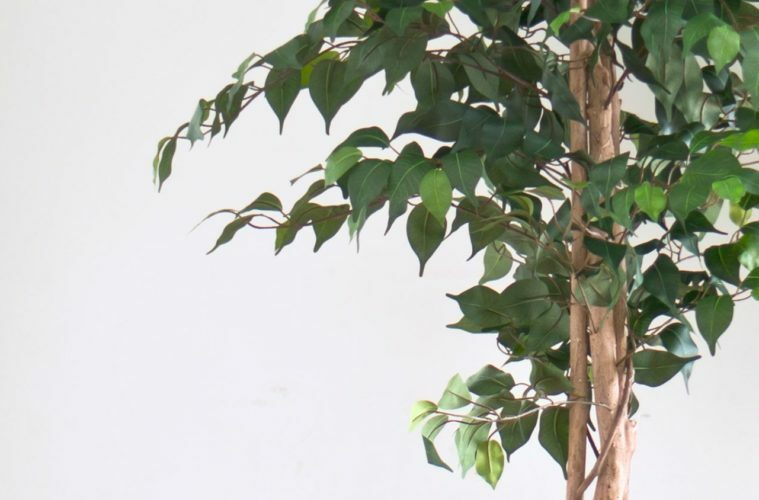 Learn how to repot a silk tree so you can change the ugly pot that came with your faux plant to a planter that looks more proportional and matches your home decor. You’ll notice in the video that the pot that came with the silk ficus tree is tiny, plastic, and ugly. That’s not a problem. It’s actually a good thing. A tiny pot means I can repot my silk tree into a bigger and nicer pot. After all, a good silk plant company makes high quality silk plants, not ceramics. You should get your planter somewhere else. 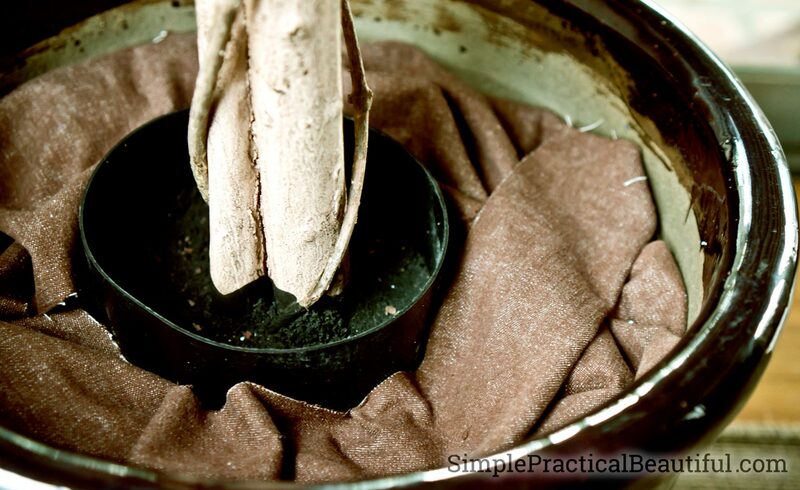 Besides choosing a well-made pot that you love, make sure that the base that came with your silk tree will fit inside of your new pot. This shouldn’t be hard since most faux plant pots are too small and your new pot should look big enough for a real plant to grow in it. 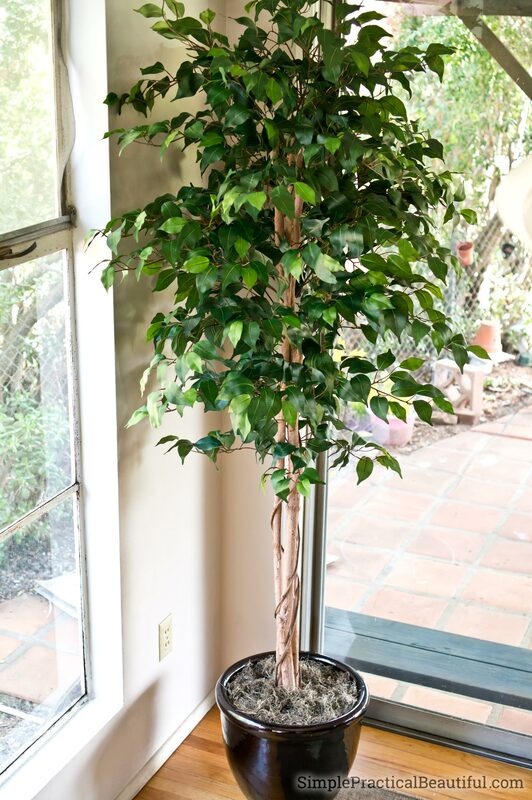 For example, a real ficus tree would need enough space in a planter for its roots, so the planter for my faux ficus tree should also be that big. 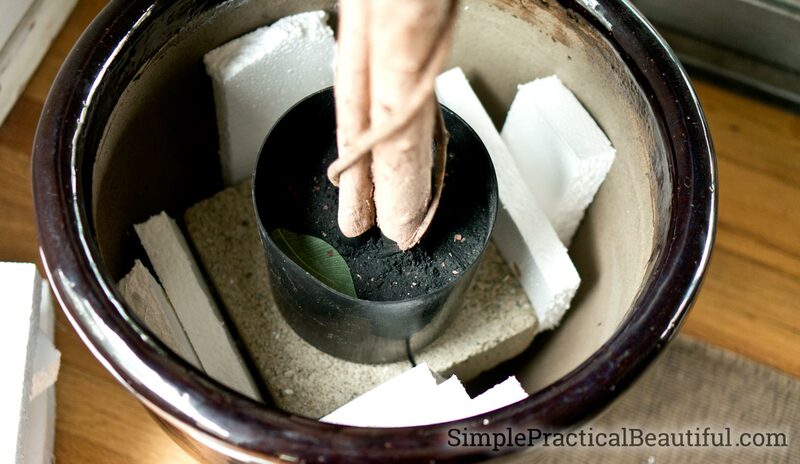 Place something sturdy, like bricks, inside your planter for the silk plant to sit on. This does two things. First, it raises the bottom of the trunk to be level with the top of the new planter, where it should be. And second, it makes your silk tree taller. The taller a silk tree is, the more expensive it is, so by repotting it, you can buy a smaller silk tree and add height. Just a side note about the picture: it shows how I planned to make the base. But it ended up making the tree a little too tall for the room, so I readjusted the base and made one out of three bricks instead. This made the tree a little lower in the pot, but not too low. 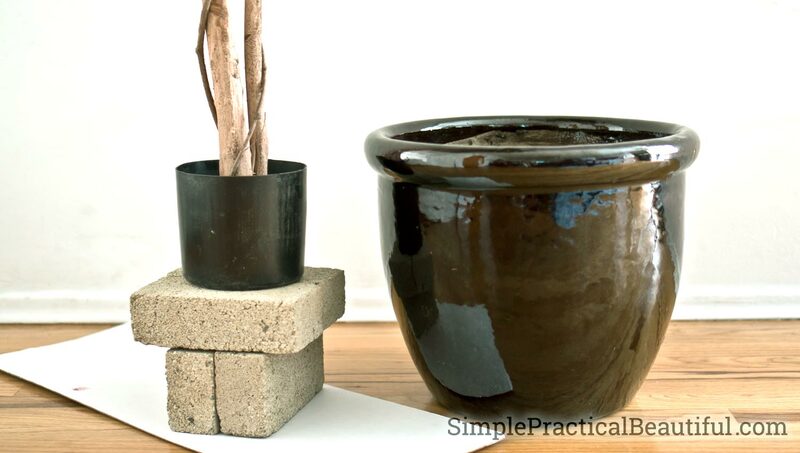 The bricks are heavy and so it the ceramic pot. Since I didn’t want to add any more weight to the whole thing, I used foam to wedge the brick base in the pot. It would be easiest to use expanding foam sealant to secure the base. Just spray it in and watch it fill up all the nooks and crannies, holding everything tightly. However, expanding foam is permanent, and I may want to redecorate and change my pot sometime in the future, so I figured out a more temporary solution. I took some left over styrofoam packaging and cut it into small rectangles. 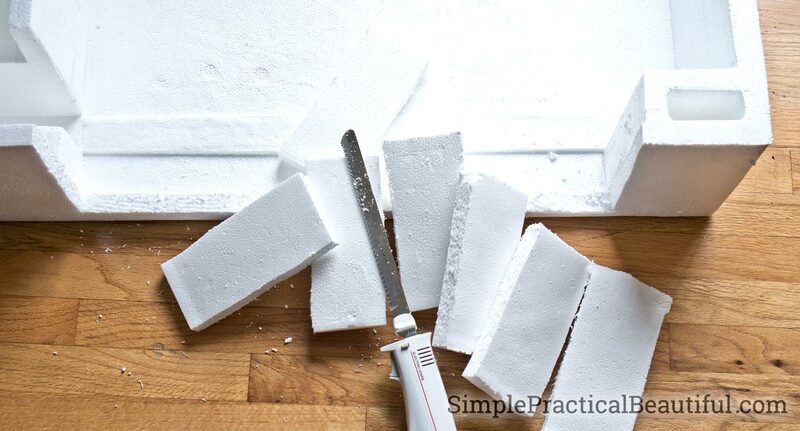 I use an electric knife to cut any kind of foam, including styrofoam, because it make less of a mess. There’s still some bits to clean up, but the electric knife slices through foam very easily. I wedged those styrofoam pieces around the bricks until nothing could move. Now the base is secure and ready to hold the silk tree. 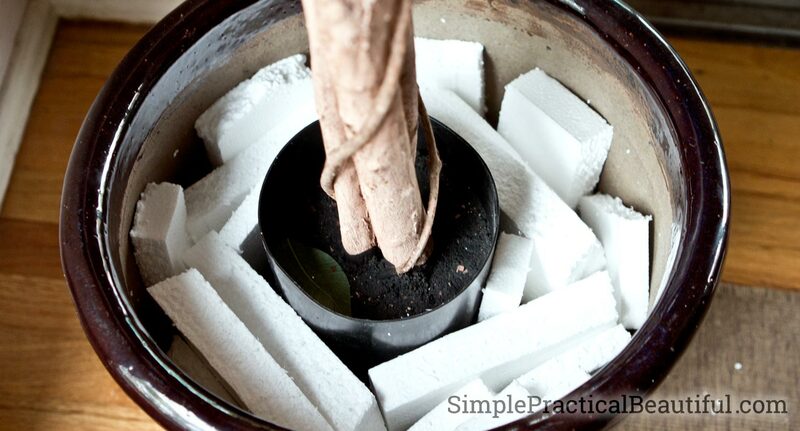 Place the silk plant in its original pot on the base inside the new pot and secure it. Again, expanding foam sealant would be easiest, and probably hold it the most securely, but I used pieces of styrofoam so that one day I can remove it and change pots easily. A real plant would be in dirt, so you don’t want any bits of foam or base to show when the repotting is done or it will make your plant look fake. I used brown fabric to cover the styrofoam. Brown craft paper or packaging paper work too. I had planned to use the packaging paper that comes in so many amazon.com orders, but I didn’t have any left. That stuff is so useful. Luckily, I had this scrap of brown, dirt-colored fabric. The easiest way to make a planter look realistic is to add spanish moss. 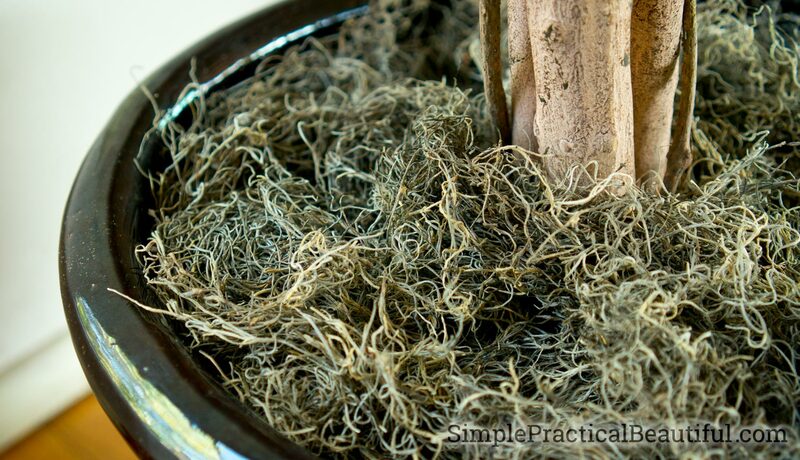 It’s inexpensive, natural, and looks like the forest floor where a tree or plant would naturally be growing. There green, brown, and other colors of moss available, depending on the look of your plant. I chose brown. Green might have made the leaves of the tree look more fake. 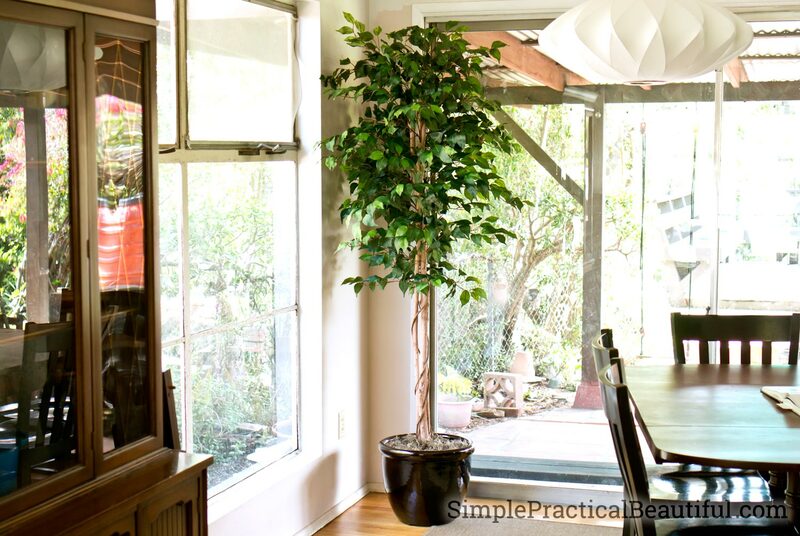 And here’s my newly repotted silk ficus tree in our dining room. I love how the tree looks. And it’s a well-made tree so it looks good close up, which is important when it’s just a couple of feet away from where people sit to eat dinner. 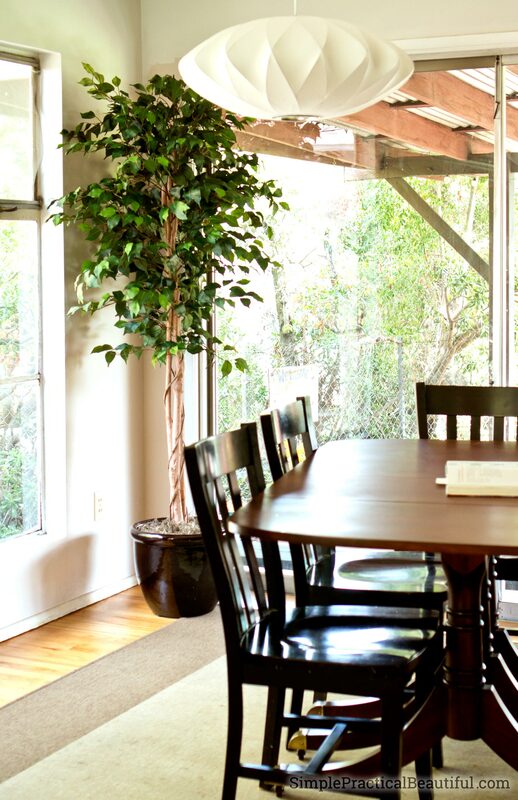 In the photos you can tell that we still have a few more projects to get done in our dining room makeover. A post about the new light is coming soon. But we need to finish painting the walls. They are half pink and half white right now! I love how our dining room is starting to look. But you can see the reflection of the bright orange rain barrel in the glass panes of the midcentury cabinet. I’m thinking we need to do something to camouflage those rain barrels. Rebecca it looks really great and the pot complements the height of the plant perfectly. Your video review was also very helpful. I need to get me one of these because there is no way I am going to grow anything with my brown thumb.